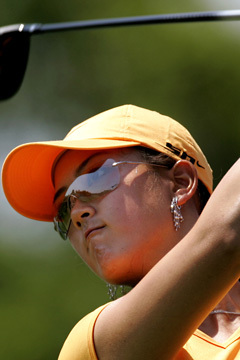 Michelle Wie was at 5-under 139 through two rounds of the LPGA Championship. HAVRE DE GRACE, Md. » Dorothy Delasin kept pouring in birdies and expanding her lead yesterday in the LPGA Championship, which turned out to be a lesson for more than one player. Michelle Wie, playing in the same group, realized that putts really do drop into the cup every now and then. She started making some birdies of her own, kept pace with Delasin and wound up with a 4-under 68 to get back into the mix. Karrie Webb saw a leaderboard with Delasin at 10 under par and didn't blink. "The biggest lesson I've learned in the majors is to hang in there," said Webb, who won the Kraft Nabisco Championship two months ago after starting the final round seven shots behind. "Funny things happen." Strange things happened, for sure. Delasin hooked a tee shot into the woods and made double bogey. She chunked a wedge from a sodded divot and made bogey on one of the easiest holes at Bulle Rock. And she had to settle for a 1-under 71, which still made her the clubhouse leader at 6-under 138 by one shot over Wie and three others. Then, blue skies quickly yielded to the rumble of thunder, causing a 5-hour rain delay. Annika Sorenstam played one hole right after lunch, and when she got to the second tee it was almost time for dinner. The three-time defending champion made two birdies and was 3 under through eight holes when the second round was suspended by darkness. It was to resume at 8 a.m., with 70 players unable to complete their round. The delay was so long that when Natalie Gulbis finished her round of 73 some 10 hours after she started, the last group was being announced on the first tee. "Still too many holes left for the round to say too much about it," Sorenstam said. Wie still didn't get much out of another superb game from the tee box and fairways. She was poised to get into the lead when she hit a knockdown 6-iron up the hill and into a stiff breeze into 10 feet, but missed the birdie putt. And she was 30 feet away, pin-high and just off the green on the par-5 eighth, until hitting a pedestrian chip and missing the 6-foot birdie. She wound up at 5-under 139. "I'm playing really well right now, and if I can just get things going, I think I can shoot really low out here," said Wie, who has been under par in all six rounds at Bulle Rock dating to last year, when she was the runner-up. Nicole Castrale, who began this major with a career-best 64, stumbled to a 75 and joined Wie in the group at 139 with Mi Hyun Kim (71) and Shi Hyun Ahn (70). Delasin goes about her business so quietly that when she made a detour to use the bathroom, no one realized she was gone until she nudged through a few fans to get back inside the ropes. But no one could mistake the sight of a birdie putt disappearing into the cup, and that happened a lot. Even when she fanned a fairway metal toward a hazard, hit so poorly that it stopped short of the creek into thick rough, Delasin pitched softly to 15 feet and holed the birdie putt on the par-5 15th, starting a string of birdies. She hit another fairway metal to 4 feet on the par-3 17th, made a 15-footer on the first hole after making the turn, stuffed a wedge into 5 feet at No. 2 and ended her run with a wedge to 12 feet behind the hole on the par-5 second. "I was swinging it good and I was putting really well," Delasin said. "I just put myself in contention for the weekend, and I want to keep the momentum up." Wie felt the same way. The 16-year-old, who started her week by trying to qualify for the U.S. Open, looked as though she might struggle to make the cut late Thursday afternoon until finishing with three birdies over the final four holes. "It was very important for my confidence that I made three birdies," she said. "I was playing well yesterday, and the last four holes kind of showed it. And then it really helped today." Even so, there were moments of doubt. Wie lipped out a 4-foot birdie putt on the 16th, and an 8-foot par save from the bunker stayed well to the right of the cup. She was six shots behind Delasin, but three straight birdies allowed her to keep pace. And it wasn't long before Delasin faltered. Delasin, who won the U.S. Junior Girls and the U.S. Women's Amateur as a product of San Francisco municipal golf, hooked her tee shot so badly on the sixth that she could only punch out of the trees into the rough, then missed the green and took double bogey. She laid up on the par-5 eighth, but found her ball in an old divot, tried to jab at it and came up woefully short of the green. It was the first time Delasin played with Wie and she had no complaints, especially with the largest gallery at Bulle Rock. "When I was winning, leading tournaments, the crowds were the same, so it wasn't a big deal," she said. "I like having people watch, whether they're watching me or Michelle or anybody."